Attention: Click Here For Current Info On These Lenses. Edit: Bill N.Y. 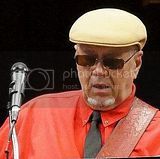 I have recently been working-with the Proprietor of this site [A.J. 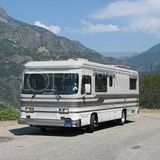 Philips of AJ's Classic Lenses], regarding a replacement lense for the KD518 Clearance Lights, which many of us have as "cab lights", "running lights", "marker lights" or "clearance lights" ["whatever" you would like to call them] on the roofs of our Barths. LS336 is the original lense for the KD518, and finding a replacement lense for the KD518 has been discussed on Barthmobile.com a few times in the past 2 years. Taillightking.com was first mentioned by "SKY" in a post on 24 May 2006, as he was able to procure the last 2 LS336 Lenses [1 AMBER and 1 RED] and was drawing attention to this site in regard to the replacement of these lenses [or whatever-else you might-be looking-for]. A.J. recently sent-me a sample of the "Like" Yankee 77, which is very similiar to the LS336. The "Like" Yankee 77 is just a-bit longer and a-bit narrower than the LS336, but fits-with the KD518 Housing with ease. The "Like" Yankee 77 is also a slightly different "profile", yet would be un-noticeable from any distance. The primary difference is the location of the mounting hole. The mounting hole is approximately 7/16ths of an inch forward of the "mounting post" on the fixture of the KD518. I have cut a 1" long and 1/2" wide piece of sheetmetal and drilled holes at 7/16ths [on the centers], as a means of manufacturing an "adaptor" for the Yankee 77 Lense. The "adaptor" is mounted horizontally to the mounting post of the KD518's Housing and extends "forward". The "Like" Yankee 77 Lense is then placed appropriately and secured to the forward hole in the sheetmetal "adaptor". This Lense comes in both AMBER and RED at a cost of $5.00 each from the Tail Light King. I have also replaced the #67 incandescent bulbs with a #67 LED Bulb from superbrightleds.com. These bulbs come in both RED and AMBER and have 15 LED's ...9 LED's pointing skyward ...6 LED's surrounding the perimeter pointing "out" or horizontal ...these bulbs look good in this application. These bulbs are $4.95 each. Gaskets were not available, so I thought I would purchase some flat-stock neoprene, make a template, and manually cut a bunch of new gaskets. I would appreciate any feedback on this "idea", as I know that there have been several of us searching for a replacement lense for the KD518's ...finding the LS336 Lense seems to be a futile search. I have tried a prototype of this "idea" and it fits snugly to the housing ...it has just recently become winter in Minnesota, so I might not finish this project until it warms-up in March or April. I would like to hear how well your adaptation of the new lens for the marker lights goes. I have a fair amount of crazing and cracking on my marker light lenses. 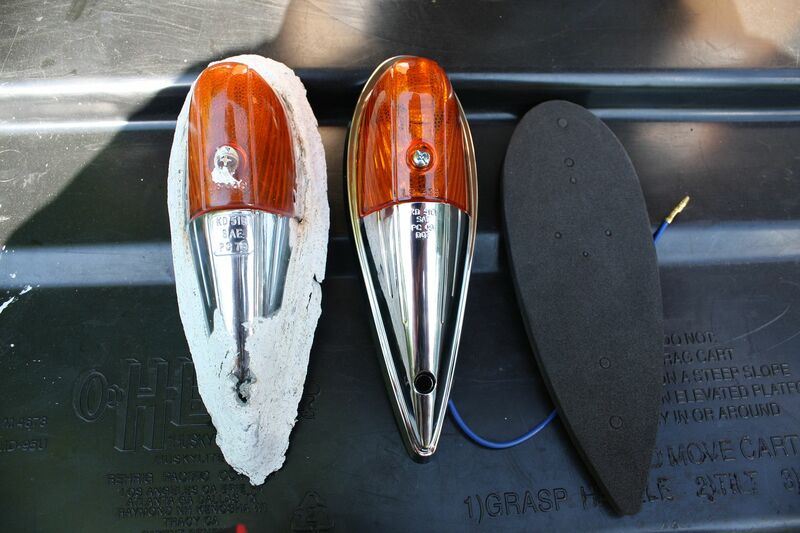 My plan was to replace the whole marker light assembly. I have found a similar looking replacement, but they are fairly expensive. When you get around to finishing this project, please post again. I am kinda in the same boat as you, since I'm not really willing to spend the cash to replace the entire light assembly, mine are also rivited to the roof, and if it doesn't leak now then why mess-with-it and cause a possible leak??? You had mentioned the Federal Mogul 1312, assuming this was located at Trucklite.com. It's replacement lense actually looks closer to the LS336 than the "Like" Yankee 77 Lense. It's the dimensions that are unknown. I wonder if there is a way to obtain the 9087 replacement lense for this light in order to give-it a try??? J.C. Whitney also has a Marker Light that looks similiar to this and is sold in a set-of-5 for $46.99 ...I guess we would need 12 lights total, so you'd end-up with 3 extra and still not know if the mounting holes to the roof would match-up ...it appears that it only comes in AMBER and I'm pretty dead-set to keep the rear of my truck illuminated in RED. I will check-with the Tail Light King and see if he can get the 9087 Repalcment Lense, so that I might give-it a "fit-test". I am more than likely going with this plan if I find a Lense that fits better than another [or just go-with the Yankee 77 Lense] ...the location of the mounting hole is probably going to be a problem on ANY replacment lense, unless it was specifically designed to fit the KD518. Thus, the need for a simple "adaptor". I was going to go on a salvage yard search in the spring for LS336's, but you're running the risk of finding lenses that are in the same condition of the ones you already have. They do make a red lens for the Federal Mogul 1312. They were not very expensive. If I was to buy 3 "5 packs", I would have also ordered the necessary red replacememnt lenses. $160 bucks is alot to spend just to replace the lenses. The old marker lights are just not available any more. I started pulling the original lenses off and using a clear epoxy to kind of glaze over the exterior of the lens. This gave it a coating and sort of supported the original plastic. So far, so good. Did you have a source for this lens [9087 / 9087A for Federal Mogul 1312A]??? If so, I would love to order 1 [color is not important at this point], just to see how it would fit on the KD518 Housing. Do you have the dimensions to this Lens??? * Width [at the widest point(rear)]? * Height [at the highest point(front) and at the lowest point(rear)]? * Distance the mounting hole is located from the rear of the Lens? I have had epoxy turn yellow in sunlight over time, at least with the California sun. The thinner the coat, the more slowly it occurs. A spray clear has worked just as well for me. In my case, the epoxy coating went over a yellow lense. I agree about the yellowing over time, but figured that on a yellow lens that it should not be much of a problem. The big issue here is that the the original lens is crazed and has cracks throught the entire lens. I was washing the coach last summer and the body of my brush on the long handle wacked the lens and split it apart. I gathered together the pieces and super glued them together and then applied a thin coat of epoxy. I inspected the others and found a couple more that were cracked through. I coated these as well. My search for a replacement lens was in vain. 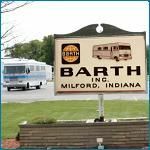 The original Barth marker lights are no longer produced and the lens are not available. 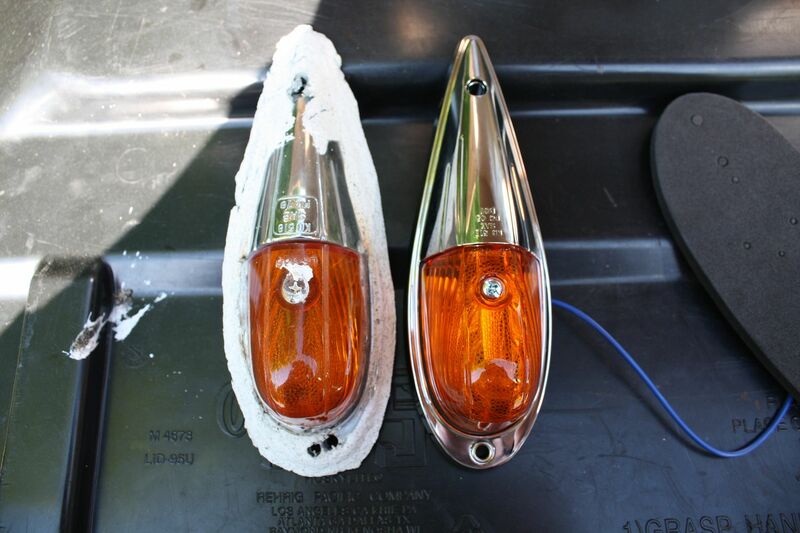 Rather than remove the marker light and replace with a new but slightly different one, I repaired the ones I have. I dont know how long this fix will hold up, but, for me, it was worth a try. If anyone out there has a better repair method for rejuvinating the old lenses, I would be happy to hear from you. As a kid, we moved from the farm to a town so small that I was often unable to buy model airplane glue, or even Duco cement. I used my mother's nail polish remover (acetone) to melt down a toothbrush handle to make glue. It worked fine, but the color of the toothbrush handle showed through the silkspan or Japanese tissue. A few years ago, I repaired an unobtainable motorcycle tail light lens in a similar fashion, using a generic lens as a donor. When I was done with the repair, I used soft brush and coated the outside of the whole lens with MEK. It softened the surface and dried to a nice gloss. Came out fine, although the owner has the bike inside almost all the time, so the long term durability of the repair exposed to the elements is unknown. I like your thinking. I have cobbled together many things that most people would never have attempted to fix. I'm going to maintain the marker lights as they are for now. With the exception of the crazing and cracking, they all work and still look good. I've also inhaled a bit of lacquer thinner, tolulene and MEK over the years. When I was a young man, my father and I resurrected several older mahogony boats by fiberglassing the hulls. If I was working on these boats today, I would restore them, but in the 60's restoring old boats was not my fathers way of doing business. My old red lens turned purple before I replaced them with 4 of the last KD's on earth. On thing I didn't do, and I wish I had, was to perform an experiment and see if the discoloration was all the way through. I wonder of one buffed a few thou off the surface if the red would return. I have the old marker lens off my '94 breakaway after I replaced them all with LED lamps. You are welcome to have them if you send your address email thru this site, I will get them in the mail to you, some are cracked but there are good ones in there. You are talking about the ones on the side/back of the coach right? Red and amber? ...if your Marker Lamps are stamped-with KD518 and the Lens is embossed with LS336, then these are the coveted lenses. ...I stopped at NAPA today and ordered a 9087 replacement lens for the Federal Mogul 1312, that Bill G had mentioned in a post from 24 May 2006. The Lens will be in tomorrow morning, at a cost of about $6.00. I will pick-it-up tomorrow and compare-it to the "Like" Yankee 77 and the original LS336. I will clean the snow-off the roof of the rear of my truck and give-it a fit test on the KD518 Housing. I will report my findings around this time tomorrow. I will be making a decision [for myself] regarding these possible replacement lenses and ordering the correct quantity before the end of the week, as I intend to replace all my lenses with "something" new, clean and clear. I will also have a surplus of LS336 Lenses in both RED and AMBER. It would be nice to distribute these to those of you who might have a couple of "bad ones". I picked-up the Replacement Lens from NAPA this morning. ...for the Federal Mogal 1312 or also know as a TruckLite product sold by NAPA, looked very similiar to the "Like" Yankee 77 Replacement Lens sold by the Tail Light King. When I got-it-home and opened the package, it was basically "identical" to the "Like" Yankee 77 Lens. Upon further inspection of this lens, it is embossed with YANKEE 77 as the SAE Number ...go-figure. So, just a a quick recap [and you would want to go-back to my original post on this subject, regarding manufacturing an adapter, in order to mount this lens to the KD518 Housing]. The "Like" Yankee 77 can be obtained from the Tail Light King for $5.00 each plus shipping. The TruckLite 1312 [Federal Mogal 1312] -or- Original Yankee 77 Replacement Lens, can be obtained-from your local NAPA Dealer for $5.99. The NAPA Model comes-with a mounting screw and a gasket, but the gasket does not fit-with the KD518 Housing. I am still planning-on obtaining some flat-stock neoprene and cutting my own gaskets, as my original gaskets are in bad shape. The LED Bulbs, mentioned in my original post work well in this application, and I have already replaced my incandescent #67 bulbs with LED ...remamber that you may have to change your original mechanical flasher unit to an electronic flasher unit if you are switching-over to LED in "flashing" applications and to match RED LED Bulbs with RED LENSES and the same with AMBER for the best visual results. Any further questions or interest on this subject can be sent to me off-list at rmortis7@earthlink.com or call-me at 612-384-3610. Forget everything you've read above... If you are looking for these, your prayers have been answered. When I was in Milford I was told about these Roof Cab Marker Lights at SLC Lighting.com. So, I ordered them, they come in Amber and Red. Now that I've got mine, and I can confirm that they are identical, I thought I would post a link. Red is limited, it appears that they have many Amber ones. 440-293-4064 ext: 157 Very pleasant people to deal-with. You can also place your order on-line.